The first South Tyneside Festival Sunday concert headline act has been announced. 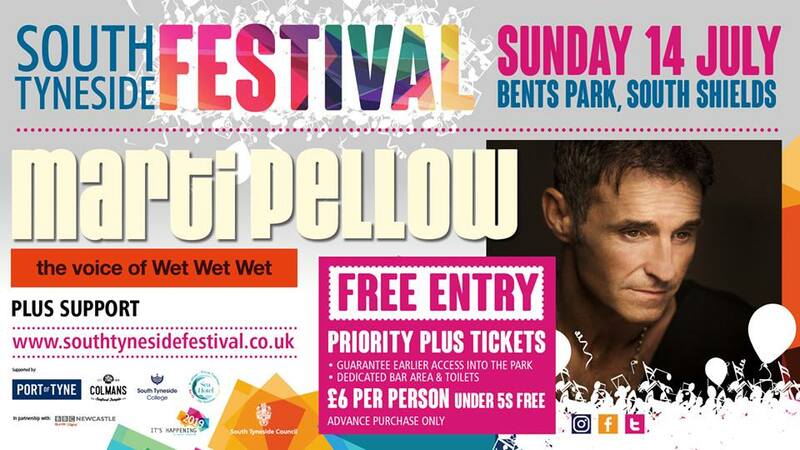 Former Wet Wet Wet lead singer Marti Pellow will be performing a free open-air concert on Sunday 14th July 2019 at Bents Park just down the street from our bed and breakfast accommodation. Admission to the concert is free however ‘Priority Plus’ tickets are available. A Priority Plus ticket allows earlier access into Bents Park to pick the best spot. There is also a dedicated ‘Priority Plus’ bar area and toilets. Priority Plus tickets are £6 each (under 5’s go free). Priority tickets are available to buy here (opens in a new window). Gates open for priority ticket holders at 12 noon, general admission is from 12.30pm.